The special exhibition Parley & Protocol: Abenaki Diplomacy, Past & Present was developed for the Fort Necessity National Battlefield, U. S. National Park Servicesite by the Elnu Abenaki Tribe in partnership with the Vermont Abenaki Artists Associationand Lake Champlain Maritime Museum. Wabanaki wampum belts, created by Johnson State College students under the direction of Abenaki Wampum Keeper, Frederick M. Wiseman PhD. The Elnu Abenaki Tribe and the Vermont Abenaki Artist Association are grateful to Lake Champlain Maritime Museum for giving us this opportunity to show Parley & Protocol in our home state before it moves to Fort Necessity National Battlefield from June 2016 to March 2017. June 23 through October 15 2015 Lake Champlain MAritime Museum, Vergennes, VT.
Fort Necessity National Battlefield protects the site of the opening battle of the French & Indian War (1754-1763). On July 3, 1754, a young George Washington commanding British provincial and regular troops was defeat by the French and their Native allies. It was Washington's first defeat and only military surrender. The event set off a global war which ended with British victory and set the stage for the American Revolution. Founded in 1985, Lake Champlain Maritime Museum (LCMM) has always respected the Native people as experts in their own history with an important perspective on the management of the region’s cultural resources. In anticipation of the Champlain Quadricentennial, LCMM partnered with the Abenaki community to honor Lake Champlain’s First Navigators. 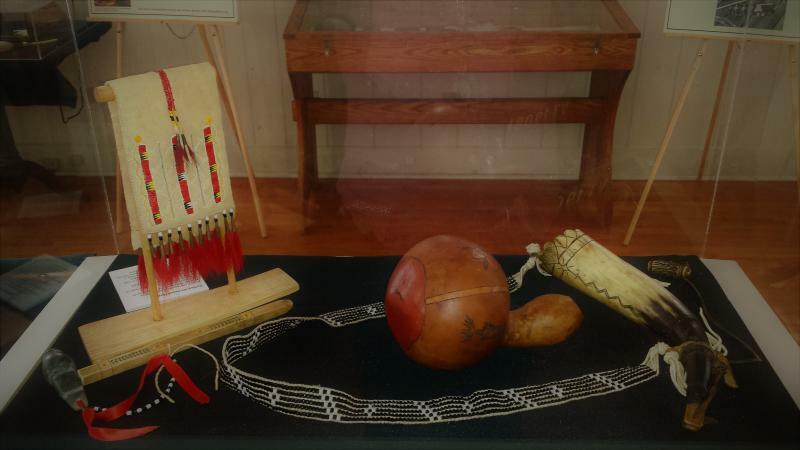 Since 2007, members of the Abenaki community have gathered annually at LCMM for an intertribal event, and have worked with LCMM staff to create and enhance the Museum’s interpretation of Indigenous history and culture. Our mission is to promote Vermont's Indigenous arts and artists, to provide an organized central place to share creative ideas and professional development as entrepreneurs, and to have a method for the public to find and engage our artists. For more information about VAAA please visit us on Facebook or Twitter.